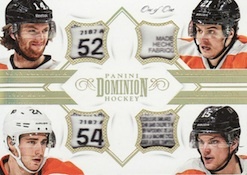 Just in time for Christmas, 2013-14 Panini Dominion Hockey makes its return to high-end hockey cards. 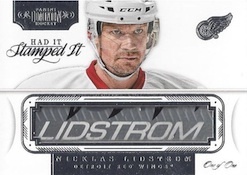 The last standalone edition came in 2011-12, and the 2012-13 NHL lockout resulted in several products being cancelled, including Dominion. 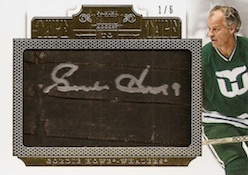 The six-card box boasts at least two autographed memorabilia cards and two additional autograph or memorabilia cards. 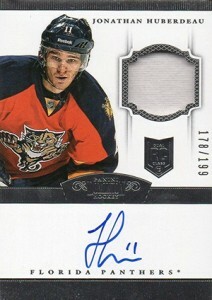 2013-14 Panini Dominion Hockey features the first autographed patch rookie cards of the year. 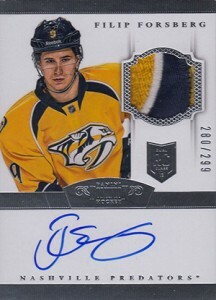 One Rookie Autograph Patch is found in each box and they are numbered to 299 or less. 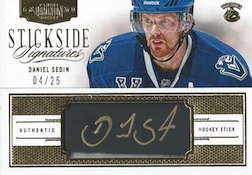 Several familiar inserts return with Stickside Signatures, Peerless Patches, and Tape to Tape Autographs. Engravatures is split into two sets. 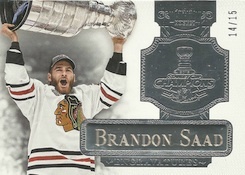 One honors the 2012-13 Champion Chicago Blackhawks and is numbered to 15. 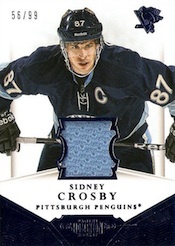 The other pays homage to previous NHL champions and it numbered to 10. 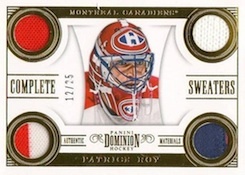 One-of-one Silver Ensigns and Rookie Ensigns include signed NHL shields. 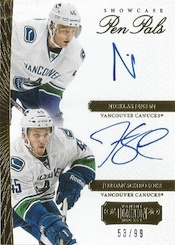 Ice Level Autograph Booklets are an acetate book card with players from the NHL Rookie Showcase. 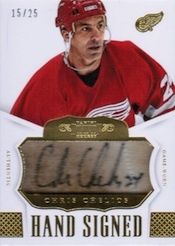 These autographed cards include a memorabilia piece and are numbered to 50 or less. Frozen Moments Autographed Booklets are a new addition. 54 cards. Click here for a detailed visual guide. 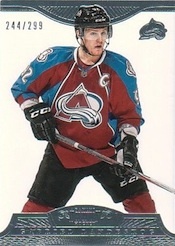 Serial Numbered #/299 or as noted. 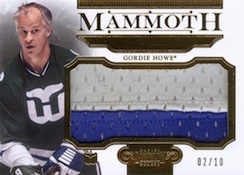 Gordie Howe cards and parallels feature half the print run of the other players. Are Pen Pals going to be included this year? The gold foil pen pals cards were so nice. Or less likely, how about the Bonded in Silver sub set? Those (bonded in silver) were the only cards from 2010-11 dominion that I even liked. Looking forward to this product being released either way! Sad there isn’t much Belfour stuff. Anyone know the team his cards are for? Thanks. 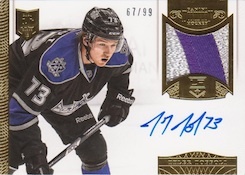 Scott � The Had It Stamped It is listed as Blackhawks and the Time Warp dual patch is listed as Stars. 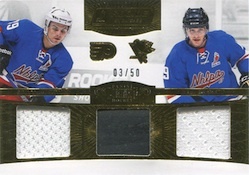 On the Rookie Showcase cards, what is the memorabilia that separates the two jerseys- piece of puck? Coach Krusty � Memorabilia in some (the rookie cards for sure) come from things like the Rookie Showcase and not actual games. 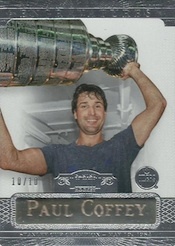 I believe these are some of the sweetest looking hockey cards released. I moly wish that the hits were more evenly offered for all teams. 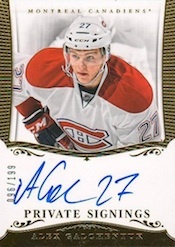 With so many teams having veterans retired from hockey, let’s get these guys signing cards. 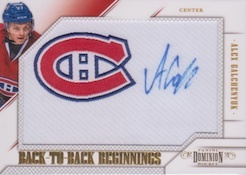 The Base cards are the best ones I�ve seen thus far in any card set. The minus part is that this product does not seem to have a very good resale value, so Its better for just personal collecting in my opinion. Love the design from this set,the cards look very sharp.